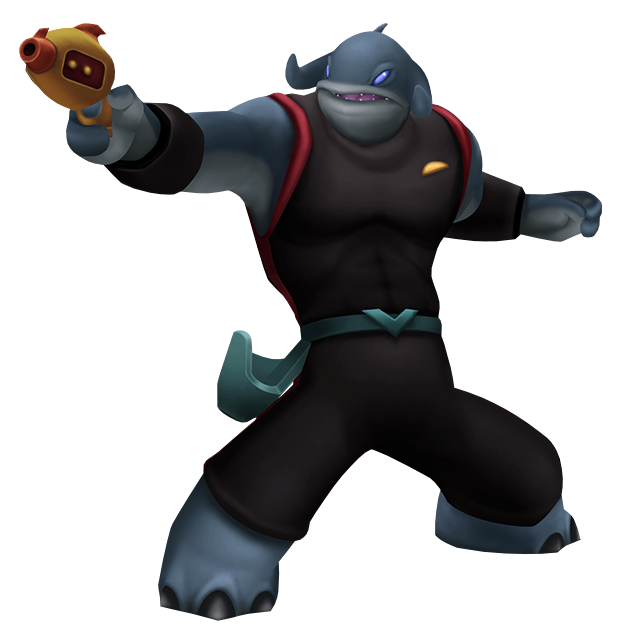 Gantu is the giant chief of police for the Deep Space spaceship. He prides himself on his work and is an ‘act first, ask questions later' kind of alien. He shows loyalty only to the Grand Councilwoman, and always believes that failure isn't an option. He loves authority, and it's this authoritative position and his stubbornness that often lead him into trouble. Soon after Terra arrives, so does Aqua who is also captured by Gantu while Gantu searches for Dr. Jumba and Experiment 626. When Gantu and the Grand Councilwoman realize that the ship's weapons are no good on the Unversed Aqua is hired to eliminate them as well as search for Dr. Jumba and Experiment 626. Later, Gantu finds Aqua, Dr. Jumba, and Experiment 626 together on one of the ship's dock and - looking for revenge from Aqua usurping him - attacks without thought. After the battle the Grand Councilwoman appears and demotes Gantu for his irrational attack.